Aloe Barbadensis (organic aloe) Juice, Vegetable Clycerin, Ammonium Cocoyl Isethionate, Sodium Lauryl Glucose Carboxylate, Lauryl Glucoside, Green Tea Leaf Extract, Licorice Root Extract, Plantain Leaf Extract, Caprylyl Glycol, Glycol Stearate, Decyl Glucoside, Cocamidopropyl Hydroxysultaine, Cocamidopropyl Betaine, Cocamide MIPA, Lactobacillus Ferment, Phenoxyethanol, Disodium Leureth Sulfosuccinate, Disodium Lauryl Sulfosuccinate, Ascorbic Acid (Vitamin C), Salicylic Acid, Panthenol Vitamin B5, Blue Green Algae Extract, Vitamin B3, Pro Vitamin A, Willowbark Extract, Tea Tree Oil, Gingko Biloba Leaf Extract, Oilve Leaf Extract, Rooibos Leaf Extract, White Tea Leaf Extract, Vitamin C, Rosemary Oleoresin, Polysorbate, Tetrasodium EDTA, Citric Acid, Essential Fragrance Oils. Microdermabrasion Organic Grains, Organic Aloe Juice, Organic Promegranate Distillate, Rose Distillate, Organic Coconut Oil, Pure Vegetable Glycerin, Dead Sea Salt, Magnesium Salt, Creatine Palmitate, Emulsifying Wax NF, Palm Stearic Acid, Jojoba Oil, Witch Hazel, Vitamin E, Green Tea EGCG, Pheonxyethanol, Xanthan Gum, Hydroilized Silk, Mannan, Black Willowbark Extract, Licorice Root Extract, Plantain, Neem Oil, Rosemary, Tetrasodium EDTA, Citric Acid, Essential Fragrance oils. Organic Aloe Juice, Calcium Bentonite Clay, Vitamin B5, Vitamin B3, Pro Vitamin A, Green Tea Extract, Grape Seed Extract, Black Willowbark Extract, Radish Root Ferment Filtrate, Vitamin C, Chlorella, Blue Green Algae, Sea Kelp, Lecithin, Vegetable Glycerin, Tea Tree oil, Pomegranate Extract, Cranberry Extract, Acai Berry Extract, Goji Fruit Extract, Mangosteen Fruit Extract, Polysorbate, Tetrasodium EDTA, Citric Acid, Guar Hydroxypropyltrimonium Chloride, Essential fragrant oils. My acne has come to an almost complete stop. No more cystic acne, just a few little whiteheads maybe around my period. Have tried so many brands from Sephora, MLM, drug store -- And this is it for me!! The only thing I wish they would do different is package the Spot Treatment mask in a squeezable tube, not in a jar. 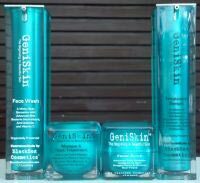 GeneSkin is a great natural based anti-acne kit. Products Work Good Salicylic Acid is good for getting rid of pimples Has natural ingredients and nutrients Hard to get ahold of if you don't have a code Salicylic Acid can dry out skin The organic grain microdermabrasion scrub is great for black heads! The GeneSkin face wash is good, but it has salicylic acid (which is great for pimples, but in my experience, tends to dry out my skin if I don't moisturize right away) I think I'd personally prefer BlackBox's 'Frost' Face Wash to the geneskin wash, but for somebody with chronic acne, the geneskin would be better. 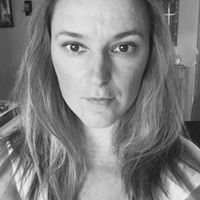 You can't buy black box products unless you have a contact name or a code, which is kind of inconvenient, but I use shopping cart code AY1029 and that works.